A cold-hardy perennial which can survive temperatures to -30C (-20F). Lovage, Cosmos, Squash, Beans and Echinacea. Salad greens, other shade-tolerant plants. Start with purchased plants, set out in spring. Many selected cultivars are resistant to powdery mildew, a common problem with this species. 30 cm (12in) each way is a good spacing for an initial planting of 3 plants. 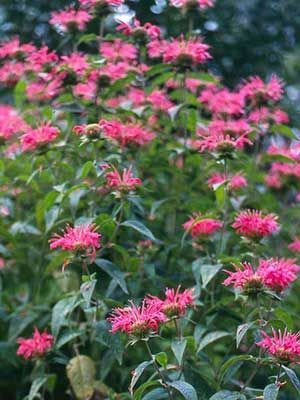 Monarda is a slight spreader, but not invasive like mint. Over time, a happy plant will form a mount 120 cm (4ft) high and wide.